Yesterday marked the end of my first month as a beekeeper. It could be the end of a short-lived stint as beekeeper. 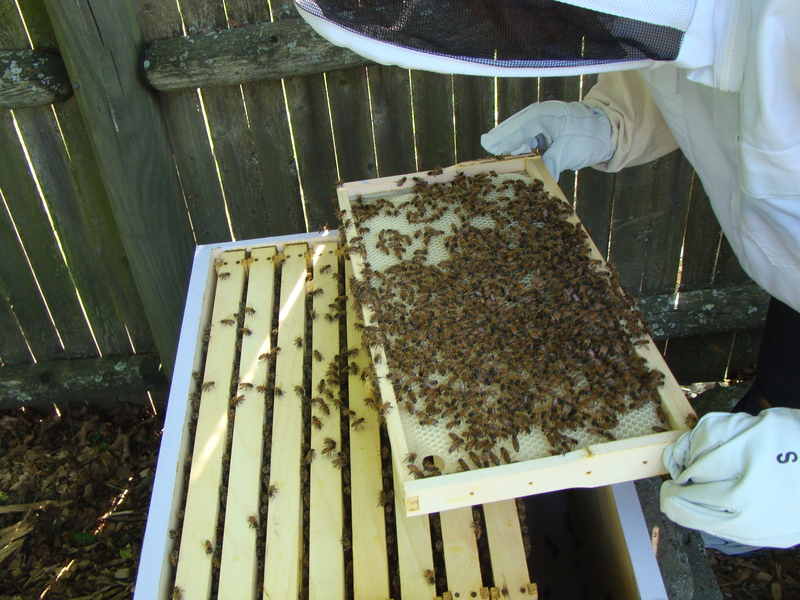 After last week’s inspection when I saw that the frames were filling up with beeswax, pollen, eggs, and capped brood, I was anticipating a big step forward by adding frames to the upper deep box. These frames will give the bees even more room for new brood and for making honey for their own winter stores. Success on that front, the top box is filled with frames. That might have been the only success of the day. On a scale from one to ten (ten is highest), this week I’d give the beekeeper (that’s me) a two, at best, even though it started out reasonably well. I gave the bees a few puffs through the entrance and the inner cover. Then, I gently started to inspect each frame. The bees had been busy since last week. Nine frames were covered with drawn wax and a lot of the wax cells were filled with things: eggs, larvae, capped brood, pollen, and honey. I even saw the queen hard at work. Some of the cells in the middle of the hive, where I remember seeing capped brood last week, were empty. I assume that that my first round of baby bees has hatched, cleaning out their cells which now await another round of eggs. To my novice eyes, everything looked fine. No new supercedure cells either, so Nancy was right, they were just practicing. I added the second box on top, without the inner cover between the boxes this time. Then, I added ten new frames and covered everything up with the inner then outer covers. All was still going well. With the upper box filled with frames, I now have to change how the bees are fed their sugar syrup. The feeder I have is known as a Boardman feeder. So far, the feeder has rested on top of the inner cover, sitting inside the empty upper box, but that won’t work anymore. 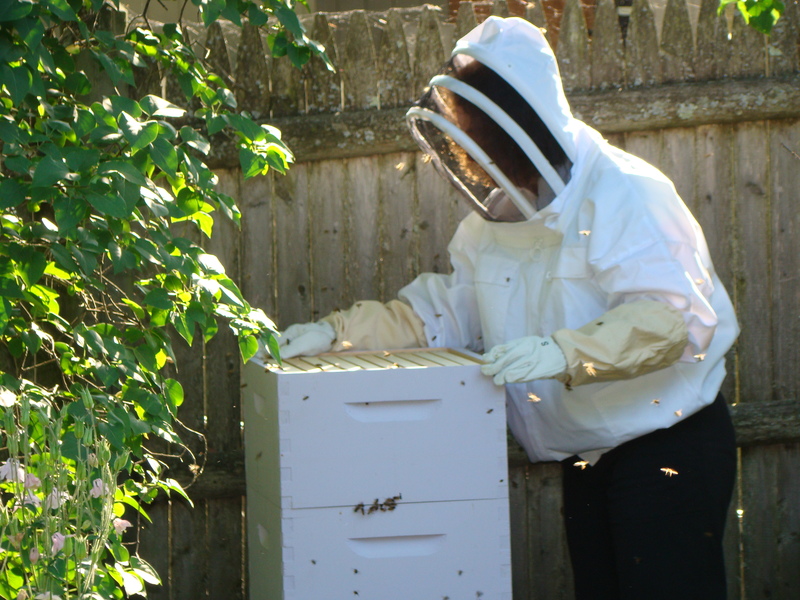 The feeder can protrude from the front of the hive, so that was the goal. Easier said then done. The first issue was that the smoker was out, again. Feeling I was almost done, I underestimated how much I was annoying the bees and just continued along. To place the feeder at the entrance, I had to remove the entrance reducer that was sitting there. Boy, did that piss off the bees. Of course, I’d feel the same way if a stranger came by and unexpected burst open my front door. They weren’t shy about letting me know how they felt. The top half of me was well-covered, but the bees starting landing on my pants and stinging through. I was trying hard to brush them off, but they kept on coming. I didn’t really want to take my pants off right in the backyard, and I didn’t want to run into the house either. Howard got stung on his arm and Bella (the dog) did too (the trifecta). No one got it like me though. I was stung by 10-15 bees. Once on my foot (through my sock), and the rest on my thighs (through my pants). My biggest problem seems to be the smoker. I haven’t mastered making a fire that puts out smoke for the length of my inspection. I’m OK at the beginning, but then the smoke peters out, before I’m done needing it. I am going to have to figure out how to do this step right or I’ll have to stop this hobby. Fortunately, I can let the bees be for the next week while we all recover this week’s visit. I think the major issue (other than wearing the wrong pants) is my lack of skill with the smoker. I’ll see what I can do about that (with Howard’s help) for my next inspection. My confidence is somewhat shaken, but I’m not quite ready to thrown in the towel. Obviously, I still have a lot to learn. Posted on 29 May 2012, in Bees and tagged bees. Bookmark the permalink. 12 Comments. That is why I couldn’t be a beekeeper! I had a bee “incident” as a child and am too afraid of getting stung, though my reaction isn’t as bad as yours sounds. 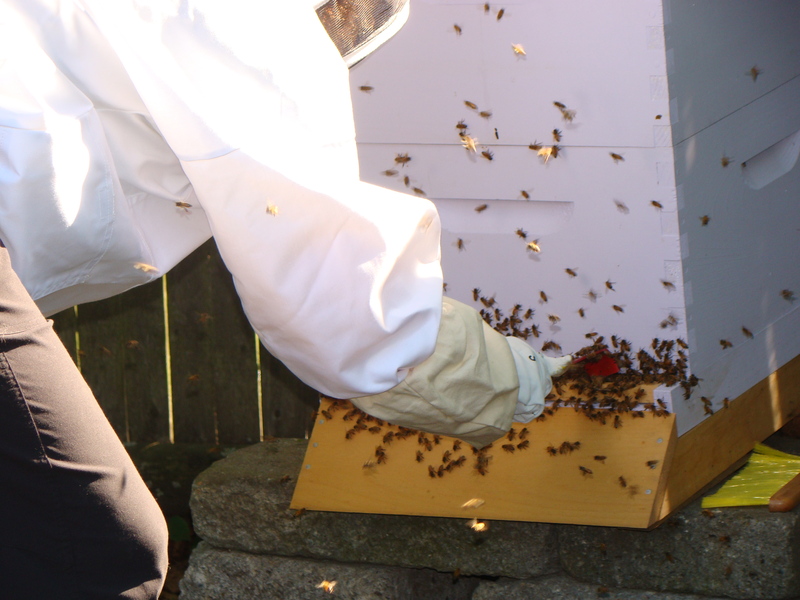 Don’t give up yet – I have been enjoying reading about your beekeeping adventures! Karen, I’m not giving up yet. 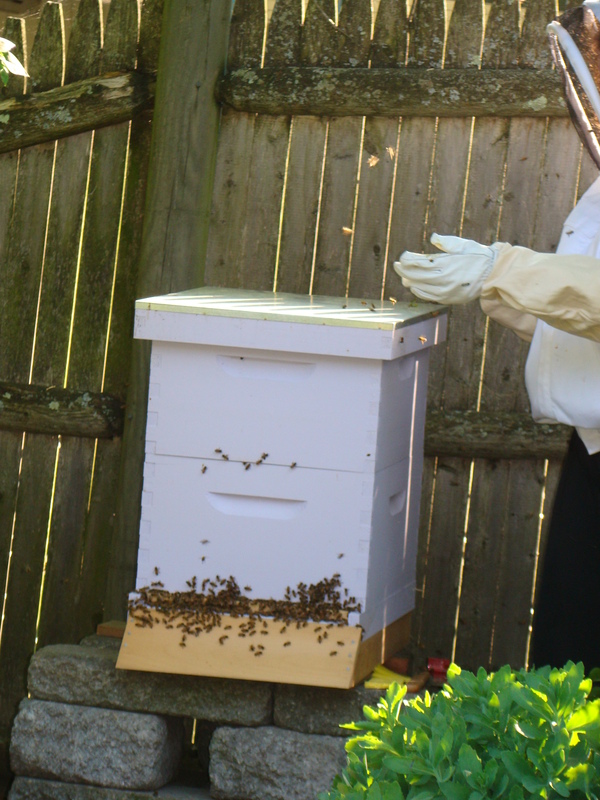 My fascination of what the bees are doing outweighs my recent setback in confidence. Betsy, your post left me a bit breathless – you have me scared there. I admire that kind of courage and know that I could never be that adventurous – hats off. You certainly have my undivided attention when I read your “bee posts”(all the other posts as well, of course), I simply love them and I wish you a speedy recovery! Andrea, I don’t think of myself as brave in this adventure but I know that I have to give the bees more respect. I am invading their space for my own education. I’m itching less today, so I think I’m on the mend. Thank you for the well wishes. Ouch! Hope everyone is feeling better. A few days out, we’re all doing better, watching the bees from afar. Oh no! I hope you are feeling better. (I remember that calamine lotion & benadryl were my best friends the time I ran over a nest of wasps – ouch). Hi Cher, Zyrtec is helping, though I’m still kind of swollen. I hope to be back to regular size in a day or two :) Thank you for the encouragement. Hopefully there will be honey to share at the end of all this. Betsy, I hope you hang in there. Is it possible that you’ll develop a tolerance to the stings so they won’t be so bad eventually? Hi David, They say that you do develop more of a tolerance with more stings. I can’t wait, though given how much I swelled up, I’m not sure how many more stings I can withstand. Hopefully, in the future, I’ll only get one at a time! Oh Betsy, So sorry for your experience! Hope you master that smoker soon!! I have been stung quite often. Believe it or not a paste of baking soda, vinegar and meat tenderizer works really well, but so does ice left on for about 20 minutes! Good luck with your next hive check! My word, Betsy! I hope you are all recovered now. That must have been so scary and I am so relieved to hear that you are not allergic to the bee stings. I collided with a bee once when I was a child running through the backyard and the sting swelled up the size of a softball. It was so uncomfortable and I wouldn’t go anywhere for an entire week! I can’t imagine getting stung in so many different places. I hope you are doing better with the bees now.